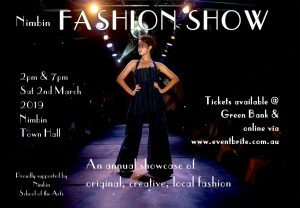 Stay tuned as we feature our designers weekly on the Nimbin Fashion Designers facebook page, and get an insight into what this amazing show will offer our audiences!! 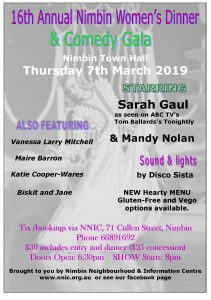 The 16th Annual Women's Dinner and Comedy Gala is happening on THURSDAY 7 March 2019 - Tickets now on sale at NNIC Monday - Friday 10am - 4pm. Also, look out for the weekly ticket purchase and Membership street stall from Wednesday 16th January. This event, in solidarity with International Women's Day (8 March), it is for women by women. 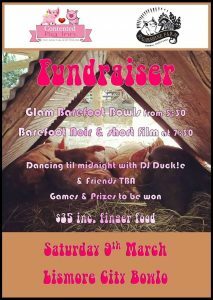 March 9th is the second joint FUNDRAISER for Contented Pig Inn Rescue Sanctuary and Sugarshine FARM Sanctuary. Fundraising events are an opportunity to combine raising money, having a great night out, and meeting their wonderful supporters. Successful events mean SO much to helping keep the doors, or gates, open to animals in need.